As one of Google IO 2010 conference attendees, I've been wondering what Google had up its sleeve for this year's big gift. The price of the conference last year was sweetened with a free Android phone given to everyone attending, and I was hoping this year wouldn't be an exception, secretly hoping for a Nexus One or even better - a pre-release version of a brand new phone. My wishes came true a few minutes ago when I received an email from Google informing me that all registered conference attendees would be getting a free phone sent to them before the conference even begins. 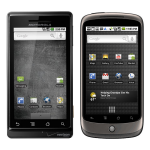 International guests will get a free Nexus One while US ones will get their hands on a Motorola Droid. Use the device to get started on your first (or next!) Android app using the latest SDK. You’ll find a ton of helpful info at developer.android.com, including the Developer’s Guide. We hope you have new apps or working prototypes by the time of I/O. That way, you’ll be able to get feedback on your app from other developers, including members of the Android team who’ll be leading in-depth sessions and answering attendees’ technical questions during Office Hours (the schedule will be published on code.google.com/io in April). To learn more about this giveaway for Google I/O, visit our FAQ page. If you have questions that aren’t answered on the website, please send an email to [email protected]. As a California resident, I will therefore be getting a Motorola Droid which I will not hook up to Verizon and instead use to write Android and specifically Droid related content for the site. Thank you, Google! Google IO offers two days of deep technical content featuring Android, Google Chrome, Google APIs, GWT, App Engine, open web technologies, and more. It features 80 sessions, more than 3,000 developers, and over 100 demonstrations from developers showcasing their technologies. Attendees will be able to directly interface with engineers building the next generation of web, mobile, and enterprise applications. P.S. I wish there was a way to get a Nexus One for Sprint instead but unfortunately it will not be available until Summer 2010, and Google is not really offering a choice here anyway.